During the height of the Cold War, the Soviet Union launched the world’s first artificial satellite, Sputnik I, in October 1957. A perceived “missile gap” led to the massive construction of Intercontinental Ballistic Missile (ICBM) sites in the United States in the early 1960s. The Atlas was America’s first ICBM. The 549th Strategic Missile Squadron at Offutt Air Force Base near Omaha was tasked with deploying the Atlas D at three sites: "A" at Mead, "B" at Arlington, and "C" at Missouri Valley, Iowa. The sites consisted of a launch operations building, three launch and service buildings, two warhead storage magazines, and associated generating and communications facilities. The 103-foot by 133-foot launch and service buildings of reinforced concrete contained the missile bays. To launch a missile, the roof of the bay was pulled back and the 83-foot tall, liquid-fueled rocket was raised upright. The Atlas had a range of 10,360 miles. This launch complex was completed in July 1960 and deactivated in October 1964. Today, it is home to Mead Atlas and Titan Readiness Centers of the Nebraska National Guard. 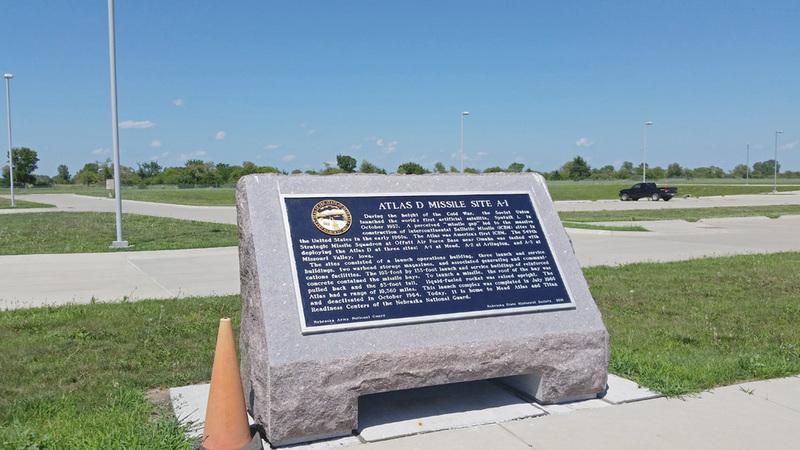 “Atlas D Missile Site A,” Explore Nebraska History, accessed April 18, 2019, https://mynehistory.com/items/show/460.